Do you remember the first time you got your first set of wheels? Were you crazy excited? Or nervous and nutty? For most of us, getting our first car signaled our independence and freedom. However, your kid doesn’t have to wait till he or she hits 16 anymore! You can get your kid started on learning the basics of driving with ride on toys! These ride on toys will introduce your child to the basics of estimating distances, control of the steering wheel and braking. For safety precautions, we would suggest that you don’t let your child drive these unsupervised. Nevertheless, there are so many cool ride on toys on the market now that you won’t be able to resist. Heck, some of them are even cooler than our cars! ‘X’ factor- you won’t mind being seen in this ride on toy yourself if you could fit! Here are our top picks for the coolest ride on toys for kids, categorized according to the age of the child. Most babies are still learning to crawl and walk so we picked a safe rocking horse/stroller that mostly remains in the same location for this age group. This ride on toy is not only super cute, it is also super well-designed! 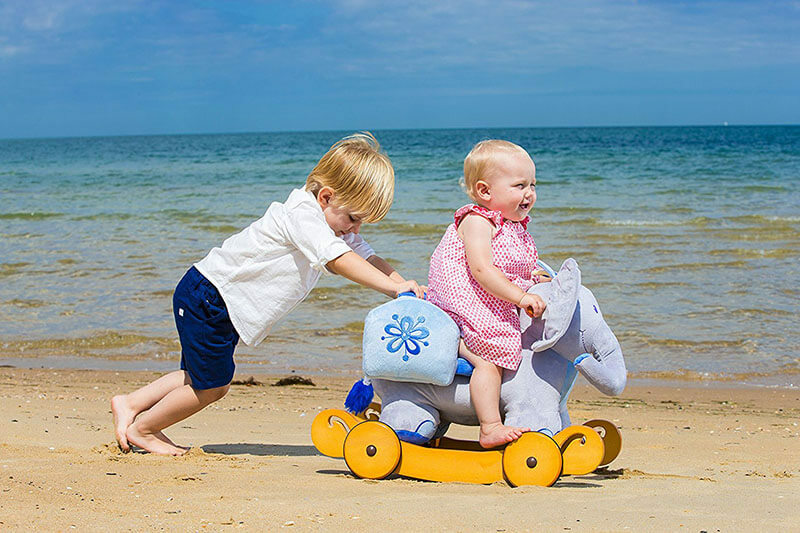 It has dual functionality as both a rocking horse and a stroller on wheels. Without any tools, you can pull out the wheels to convert the rocker into a stroller! The padding of the seat is plush, comfortable and made of breathable material. The wheels can run on any surface including lawns and sand and is wrapped with rubber to reduce noise and protect wooden floors. The ride on toy also comes with a rattle on either the ears or the tail. According to the manufacturer, this ride-on toy meets the European and American toy safety standards. 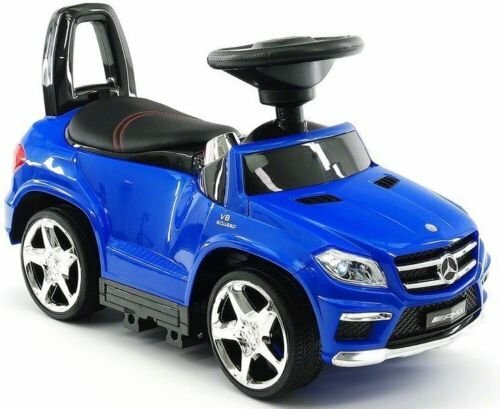 In our opinion, the Moderno Kids Luxury Mercedes GL63 Ride-On Push-Car is one of the coolest ride on toys for a toddler. Designed to look like a Mercedes, this ride on toy is serious about coolness! It has a padded leather seat, dashboard, functional steering wheel with an MP3 player and music buttons and front and tail lights. Your toddler can move around in it using his or her own leg power but if your toddler wants to pushed, it comes with a long backrest handle to make it kinder on your back. For safety, this car comes with removable sideguards and a retractable footrest support. Just like the ride on toy above, this car has folding rocking chair rails which means it can be used as a rocking ride on toy too. This toy also conforms with US consumer toy safety standards. 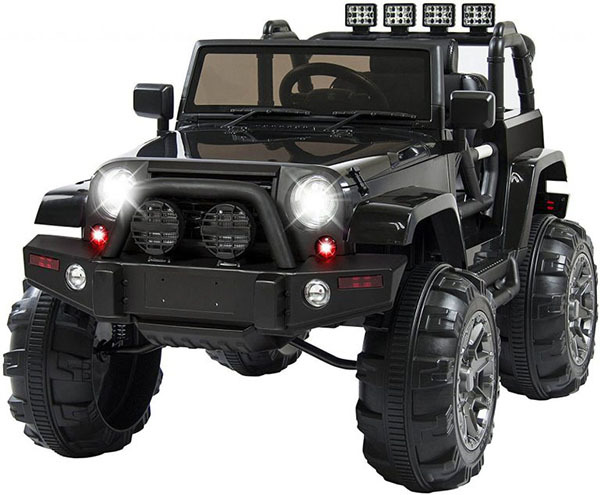 C’mon, you will start salivating when you read about this 12V Ride On Car Truck. A lot of ride on toys don’t provide a remote control option but this is one of the few brands that actually does. This is helpful when you don’t fully trust your child’s driving and you want to be in control of the direction of the ride on toy. On top of this, the plastic body is also non-toxic and the ride on toy conforms to American toy safety standards. How could you say ‘No’ to this ride on toy? The batteries run for about 1-2 hours. Time to get out into the wild! Not everyone is going to get this but this is so cute and cool at the same time! 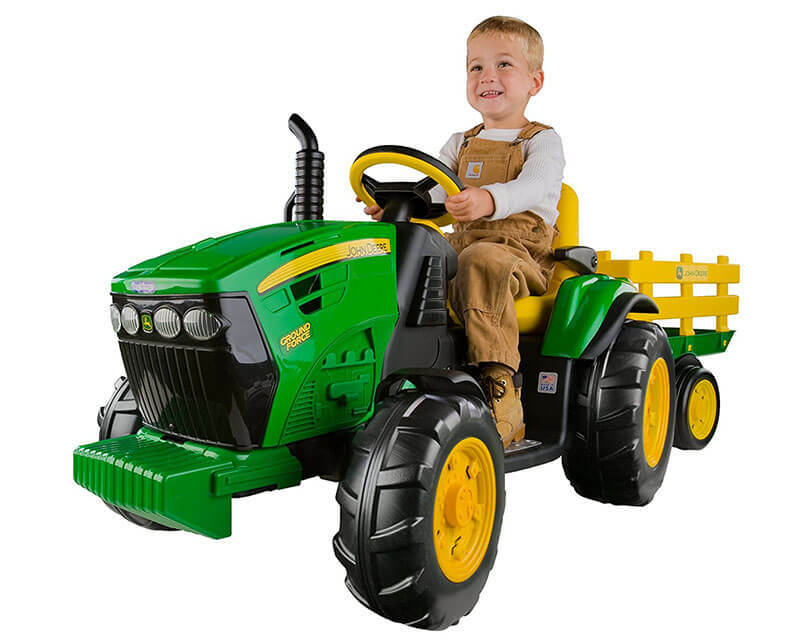 Designed to look like the adult John Deere tractor, this is a truly awesome-looking ride on toy. The colors are in the customary John Deere bright yellow and green. It travels in 2 speeds (2¼ and 4½ mph) and can go in reverse as well. You can control the speed with the second gear lockout feature. This ride on toy comes with its own brakes and the 4WD tractor wheels can work on ordinary pavement, grass, dirt and gravel too. The back of the John Deere has its own wagon and your child can actually help with carrying things. This ride on toy also comes with an FM radio. The seat is adjustable with armrests that can be lowered too. Another bonus is that the battery is pretty powerful and it doesn’t need as frequent recharging as some other ride on toys. Definitely ultra cool ‘X’ factor! 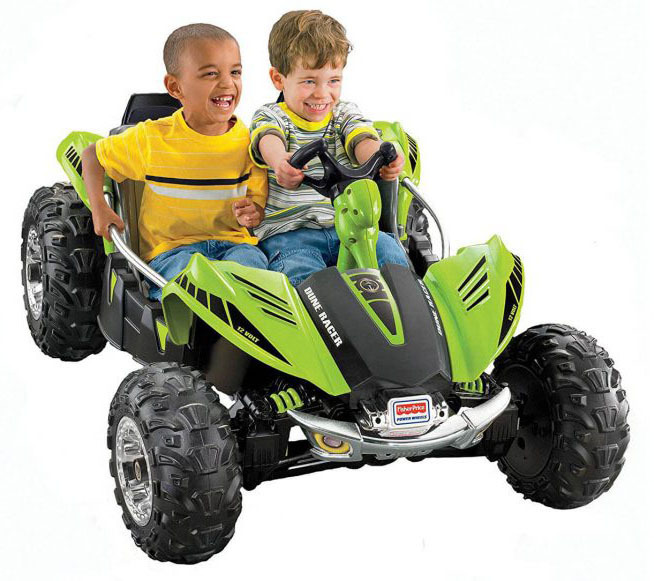 The Fisher-Price Power Wheels Green Dune Racer makes it into our list of super cool ride on toy because this toy takes not only one rider, but two riders! Yep, your child could invite his or her best friend to come along for the ride! This ride on toy can travel on wet grass, lawns, gravel and mud. It can also navigate tree roots, ruts, sidewalks and garden hoses so this is definitely not a problem for the ordinary backyard! It moves at 2.5 and 5 mph going forwards and 2.5 mph going backward. If you are nervous about your child’s ability to drive safely, rest assured that this ride on toy is designed to lockout at the maximum speed of 5 mph so that it can’t go any faster than that. It also comes with metal sidebars and a power lock brake system. This brake system will automatically stop the vehicle once your child’s foot lifts off the pedal. So many great choices for cool ride on cars. Which one are you going to get?